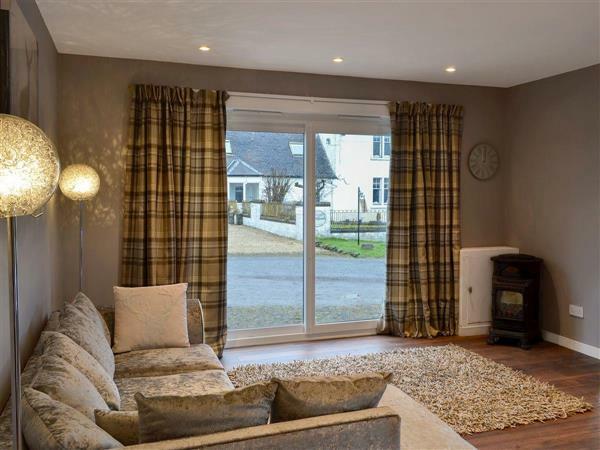 Carriage Cottage in Beith, near Dalry, Ayrshire sleeps 2 people. Carriage Cottage near Dalry is a cosy, detached, single-storey cottage, with private hot tub, which has stunning views over open countryside and is situated close to the towns of Beith and Dalry in Ayrshire. Located on Scotland’s west coast, the property, next to the owner’s home, is ideally located to explore the beauty of the Ayrshire coastline. Ayrshire offers a varied coastline, with villages, beaches and rocky coves to explore. It is an ideal location for cyclists and walkers, with Skelmorlie heralding the start of the Ayrshire Coastal Path, a 100-mile long coastal walk. Inland there is walking, cycling, gardens and castles to visit, along with opportunities to ride, fish and golf (the world famous Turnberry course is nearby). Culzean Castle Country Park, extending for over 550 acres, has a network of wooded trails passing along the beach. Explore the islands of Cumbrae, Arran and the Isle of Bute, or catch a ferry to Dunoon and the Cowal Peninsula, which gives you great access to the Loch Lomond and The Trossachs National Park. Glasgow and Edinburgh are easily reached for a day trip. The beach is 12 miles from Carriage Cottage near Dalry. With the shop 4 miles, the pub is 1 mile and the restaurant is 2 miles from Carriage Cottage. Living area: With gas wood burner and 37 Freeview TV. Kitchen area: With electric oven (gas oven from March 17th 2018), gas hob, microwave, fridge/freezer and washing machine. Bedroom: With zip and link king-size bed (can be 2ft 6in twin beds on request) and French doors leading to decking. Electric central heating, gas, electricity, bed linen and towels included. Enclosed garden with decking and garden furniture. Private hot tub for 6. Bike store. Private parking for 2 cars. No smoking. Holidays at Carriage Cottage run from Friday to Friday. Pets allowed at Carriage Cottage. For a better idea of where Carriage Cottage is, you can see Carriage Cottage on the map below. Carriage Cottage is in Ayrshire; should you be on the lookout for a special offer, you can find all the special offers in Ayrshire. It's always worth checking to see what is on offer at the moment. Do you want to holiday near Carriage Cottage (UK5684), you can see other cottages within 25 miles of Carriage Cottage; have a look to find your perfect holiday location.